2-23-12: WONDERFUL UPDATE FROM HIS FACEBOOK PAGE: "SOS Lab rescue is gettin him :-) Link on Habersham Shelterkids wall. They will STILL need funds so PLEASE everyone who pledged honor it so sweet Twitch can have the best start possible! YAY FOR TWITCH and thank you all who worked so hard for him! We rock! LOL ♥"
"Working in a kill shelter, and being the one that has to put them down, ruins you. But, everynow and then, one comes along....This guy is my one..
full of love, and he always hobbles over to give me a kiss when I walk by, but he has a hard time navigating the small kennel run. His hold is up tomorrow. Is there not a special needs rescue that cam save him? He needs OUT of the kennel runs and need to be somewhere that can fit his needs! There is ZERO space at the shelter, as usual, and pubic drop off start tomorrow. 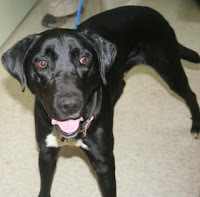 He is a BEAUTIFUL young male lab mix was brought to shelter 5 days ago. He was hit by a car, and suffered some trauma, which they think damaged his spinal cord. (YES he was brought to the vet by the person that saw him hit, but they said there is really nothing they could do for him). You can tell ...by the way he walks there was damage. SWEET dog!!! PLEASE help him!! I will have to put him down tomorrow if I don't have SOMEONE that will agree to help him. I'll figure out someway to transport if you have the room to save him and distance is the only thing stopping you from being able to save him. He is am absolutely amazing dog.